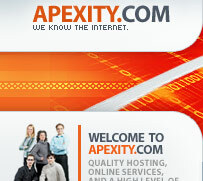 FREE with All Apexity.Net Hosting Plans!!! From $99/Year - Email Support@Apexity.com to signup. Site Studio is a full featured, browser-based Web site building tool designed to help novices to create professional, multi-page web sites. It features vibrant, professional designs and pre-built templates to speed your Web site development. It is both easy and powerful. Content and Design Separation: The content of the website is stored separately from the layout. This way, you can completely change the look and feel of their website in six clicks of the mouse, without ever having to retype any information. User-uploaded images: Thanks to the Image Uploader, you will be able to transfer images to your online account without ever having to leave your browsers. These images can be incorporated into page content or even page design. You can create an online photo album, or insert a personal picture to make it a seamless part of the page logo. Variety of pages: SiteStudio can be used to make many different pages. You can create an online resume, or build a personal photo album. Everything is done in a simple step-by-step process that is easy to learn and to follow. And because pages are template driven, you can add your own custom page types, or request pages with specific functionality from us. You can see the list of available templates. One-click publishing: Your website is published with one easy click. But even after publishing, you can go back and change it as much as you wish. Clicking the publish button again will instantly make all the changes made be reflected on the "live" version of the site. Persistence: All of your information is saved the moment it is entered. If you decide to log out, they can come back and continue building their web site from the very point where they left off. 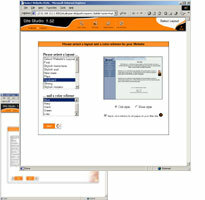 Complete control over the website: With the use of Site Studio's provided settings, you can make unique and attractive web sites. For the advanced user, SiteStudio provides a way to change buttons on the site. Advanced full screen text/HTML Rich Editor: browser-based text editor for Internet Exlorer for Windows users only. It empowers SiteStudio users to work with formatting, styles, tables, bullets and more. Rich Editor allows to copy and paste the most complex tables from a web browser or from any Office applications. Integration with on-line shops: You can create your own fully integrated usable on-line shopping Add-A-Cart system that has everything you need to operate a successful on-line business: a shopping cart, secure payment gateway and a merchant account issued by One Stop Merchant Services. For personal websites, you can create Amazon.Com Web Store. Site Studio is designed to produce a simple web page with a basic layout and several pages of content. The program itself is great! Many web hosts offer Site Studio for their clients at a price, but we allow our users to use it for free! We love Site Studio and feel that it is a great solution for many of our personal and preferred web hosting clients.